Chiropractic treatment releases the stiffness of joints and muscles, and accelerates blood circulation. ※Intial examination fee is applied only on the first visit. ※You can use quepon for first time. " 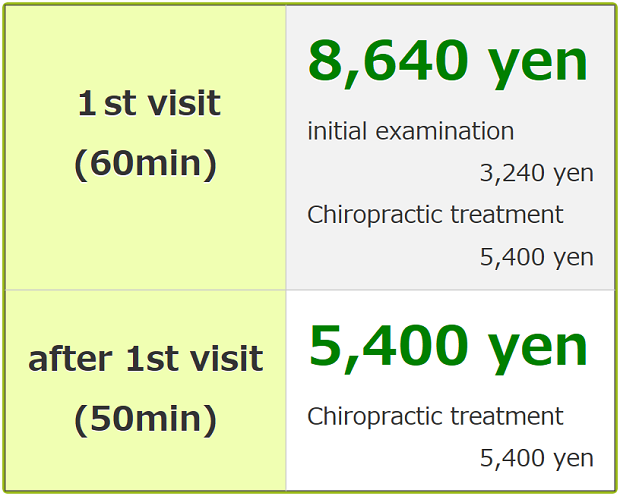 8,640yen → 4,320yen"
If you are driving to Chiropractic Center Zushi, please park your car at a parking lot near by (Shimizubashiminami, King Stor,etc.) and inform us. We cover the parking fee 400 yen. Let us know about your problems. We will carefully examine the condition of your muscles, movement of your joints, and your posture based on the information, to find out the roots of the problems. Knowing the roots of the problems, we wind down your muscles well before adjusting joints, therefore there is no necessary pain with the joint adjustments. We provide appropriate advice for lifestyle and instruction therapeutic exercise to maintain your health. Our aim is not just to remove the immediate pain, but also to improve your long-term physical condition. We provide reliable therapy based on credible knowledge and technique. Copyright © 2019 新逗子 逗子整体院 All Rights Reserved.